Jan’s school friends—Barb from second grade, Pat from I think about seventh grade—are in town for Stitches. This means another meal to create—with no meat with a face or chunks of tomato. A few ago I made some Jamaican coconut fish parcels that had a very flavorful broth, I decided to look for a soup that was similar, but different. I am making a Spanish tapas dinner for this Sunday. This is a simple tapas that you can serve with other tapas or alone with crusty bread. One of the problems with making tapas is the rush at the end to finishing cooking everything at once. You can set up this dish up early, ready to do the final cooking just before serving. I needed a protein dish to do with my leek soup. I started making these only a few weeks ago, but they are so good that I know my family will eat them whenever I make them. The last time my son-in-law, Chris, mentioned that they needed la jiao (hot pepper) to go with the hua jiao (flower pepper). 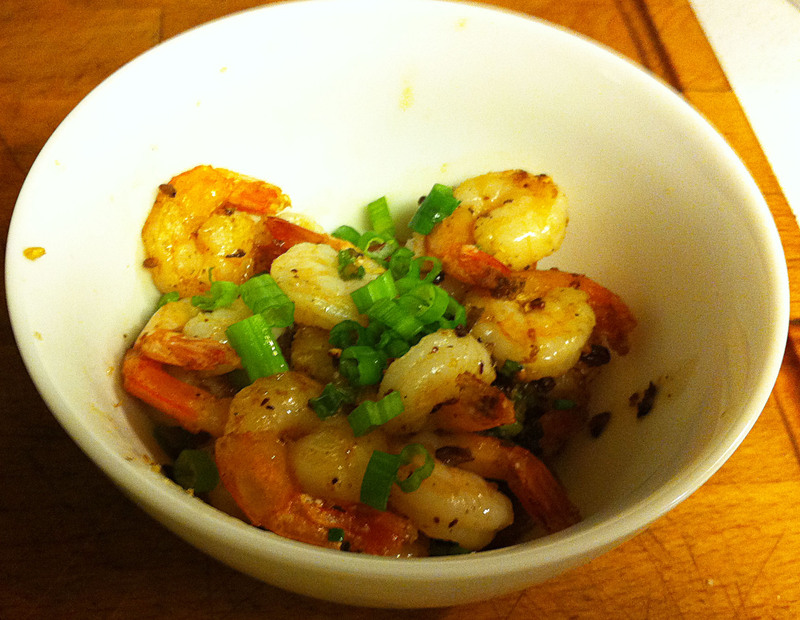 Shrimp (小虾; xiǎo xiā) are a symbol of happiness and good fortune. One reason for this is that the shells turn red, a very auspicious color for the Chinese. 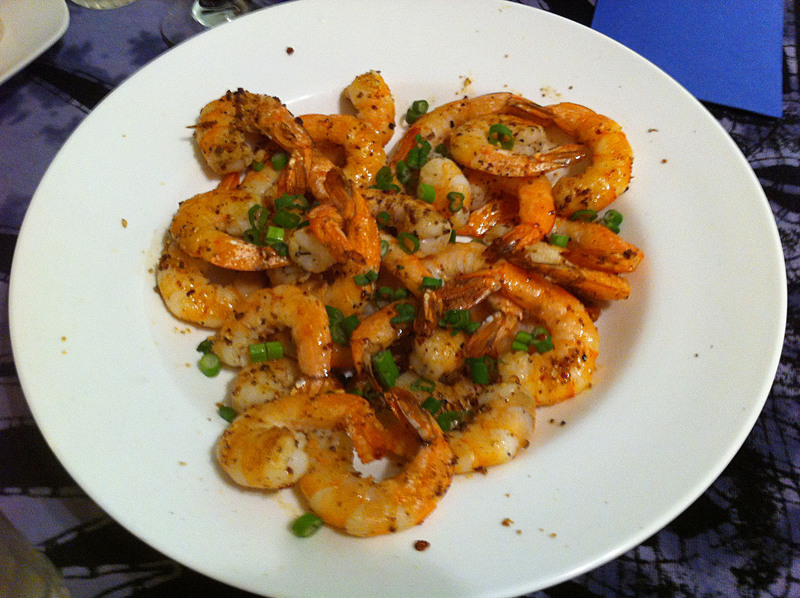 When my son-in-law, Chris, heard about the Szechuan Salt & Pepper Shrimp that I had made last week, he requested that it be added to the menu for my birthday/Chinese New Year’s feast. I wanted a main dish to go with the rice salad that Jan had asked for. Jan went to Sonoma this weekend and went to Whole Spice. One of the things she came back with was a packet of Szechuan Salt & Pepper. 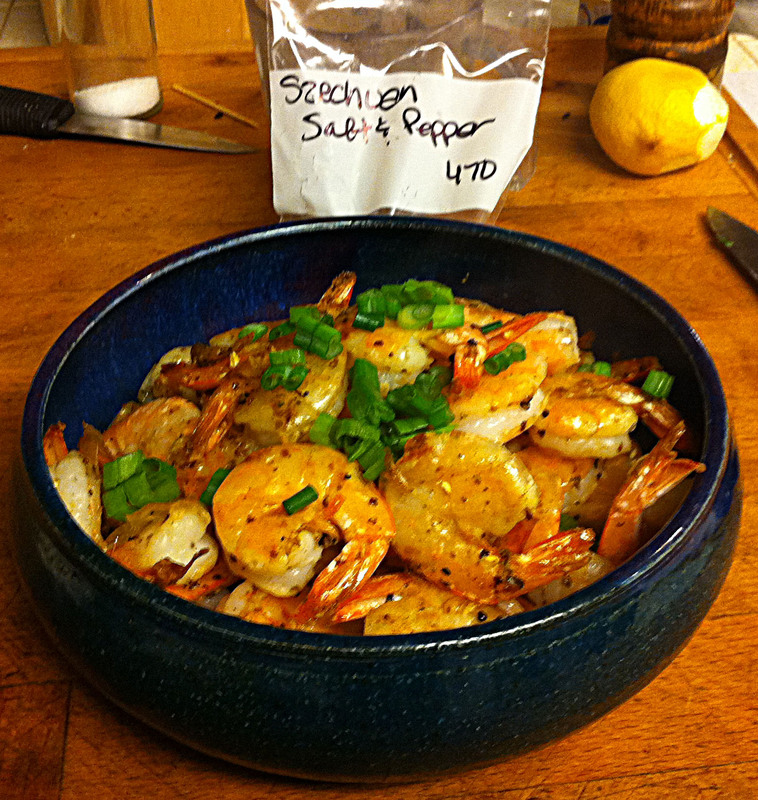 A pan seared shrimp with this pepper blend seemed just the ticket. 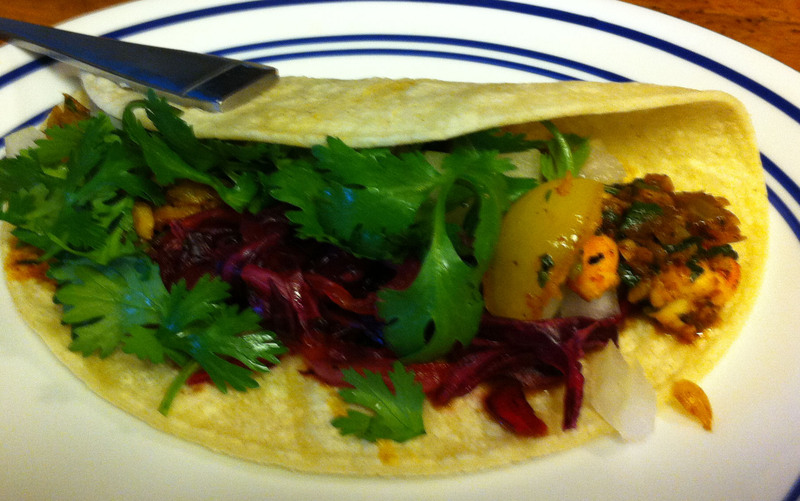 Jan needs some soft food today and she has a desire for shrimp tacos. I looked on-line and most of the recipes seemed to be sprinkle chili powder on shrimp, grill, stick them in a taco shell, and bury them with stuff. I knew I could come up with something better than that. Tomorrow I am making a French fish soup for which I need fish stock. There may be some store that sells canned fish stock, but it is not around here. 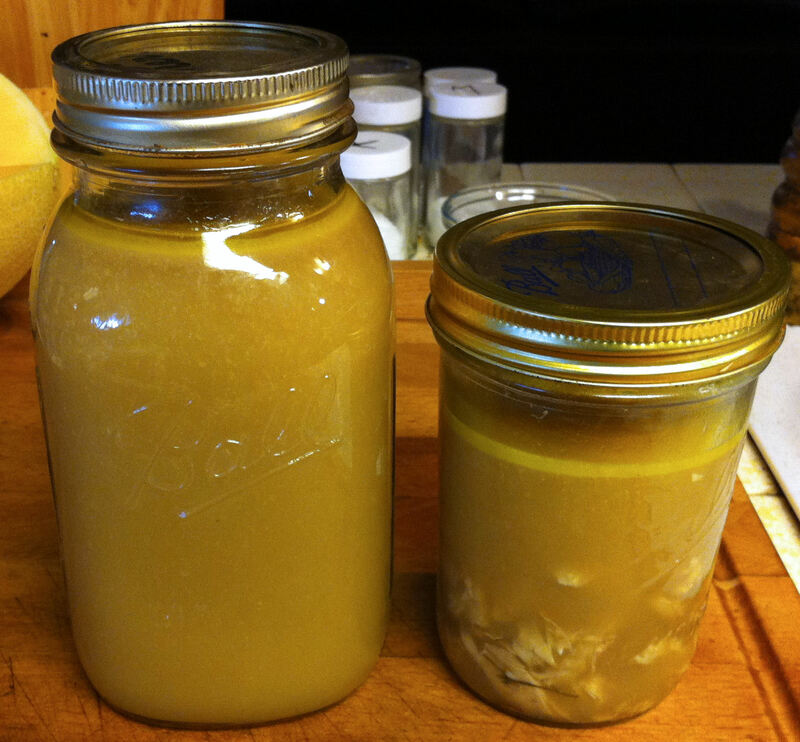 It is time to create my own fish stock. I wanted a cooling salad to go with my spicy jerked chicken and this one sounded like a good one. The mango does not fit into the Ketogenic diet, but Chris can give Myr his mango if he wishes, the rest should be OK for him. I replaced the original grapefruit with orange, because it is less sour and I prefer it. The kids really like mushrooms, so I am constantly trying new ways to make them. This is one that I started making about a year ago, but it is well worth repeating. Jan does not like bacon (a childhood trauma), but you may sauté the vegetables in the grease of 1 strip of fatty bacon instead of butter. If you do this, you may also crumble up the bacon and add it to the mix. Original recipe calls for potatoes, but I replace it with garlic toast (recipe follows). Original Note: What’s great about this recipe is that you can use whatever fish you like. Sea Bass, Wrasse, Pickerel, Pollock, Bream or Red Mullet all work well. You could even use lobster if you have it and feel like splashing out! Just talk to your fishmonger and get him to recommend a few of his freshest fish. Greek fishermen make this out at sea, using whatever they’ve hauled into their boat that day, and cooking it in seawater. That’s how I learnt to make this. Because their water is ready salted they don’t need any seasoning at all to achieve a perfectly delicious stew. Genius! 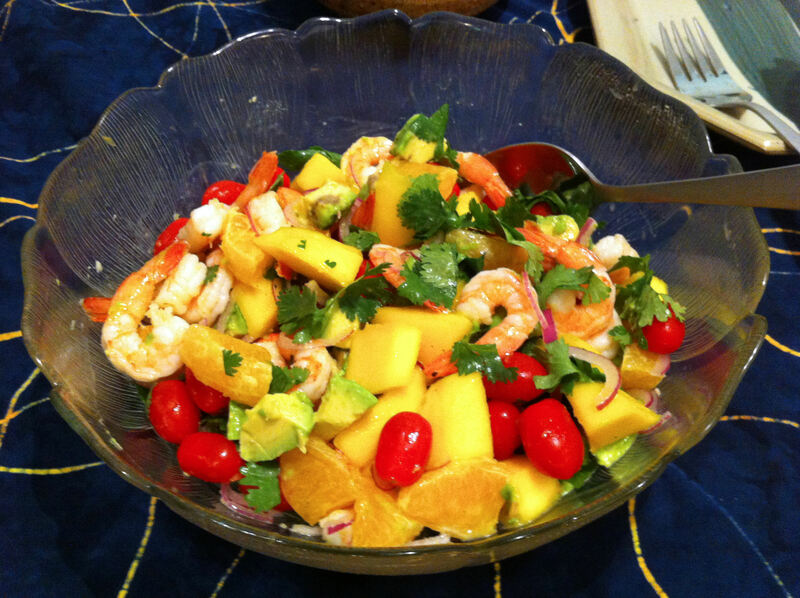 Try to use a mixture of fish, so you get all sorts of different flavors and colors in this wonderful stew.